Home Film and Television Production Happy Birthday, William Kennedy Laurie Dickson! What the fu-IS THAT WILLIAM KENNEDY LAURIE DICKSON? HAPPY BIRTHDAY, William Kennedy Laurie Dickson! This guy William Kennedy Laurie Dickson (what a long name, dude!) is an important guy in our history – one of the many underappreciated peeps that I keep digging up and trying to give my little bit of credit on their birthdays. Dickson was someone that got hired by Thomas Edison when he realized how talented the man was, and Billy-Boy here was set to working for Edison’s many business ventures. It’s funny – the more I read into the detailed history of Thomas Alva Edison, the more I am starting not to like him very much. It’s okay though, I can appreciate the man’s work and brain without liking him very much! What William’s part in the Edison legacy was has to do with the development of something called a Kinetoscope. 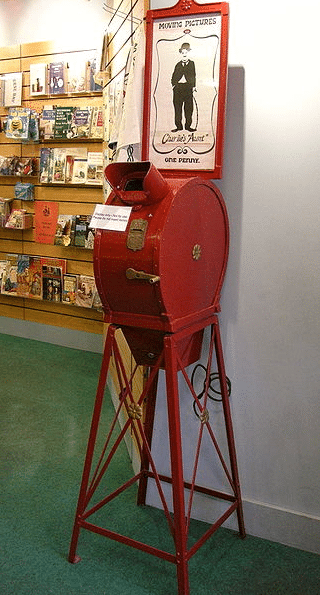 Ever heard of the Kinetoscope? It’s the first motion picture equipment! Thomas Edison made the Kinetophone, which we’ve all seen or heard at one point in our lives, but a bit later he filed a patent for an idea he had about a device that would be “for the eye as the phonograph does for the ear.” So after Edison got his Caveat, he hired William Kennedy Dickson to make the dream a reality – a moving film machine that was powered by an Edison electric light. 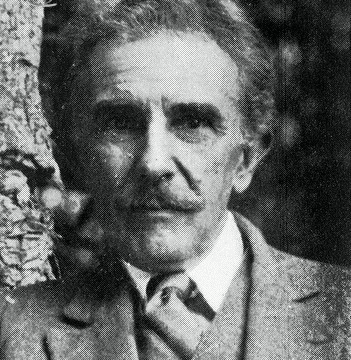 Dickson has several credits to his name, including 35mm celluloid film (for the Kinetoscope), the Kinetograph (the first motion picture camera, which Edison took the patent on), the first movie studio (called the “Black Maria”) as well as being an avid photographer on his own. 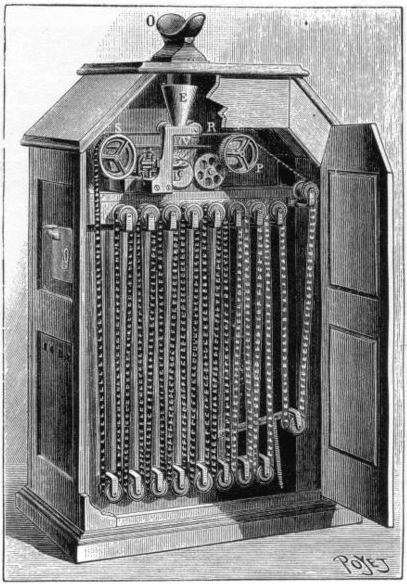 My research suggests that, in the development of the Kinetoscope, Dickson tried and tried to coat the drum type design from Edison’s Kinetophone (assumed to be at the behest of Tommy Boy Edison himself), with much epic fail. 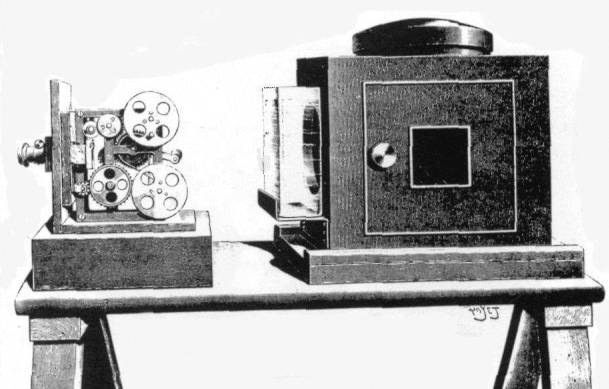 It was only when Dickson discovered a roll of celluloid film did the process of inventing the Kinetoscope become a reality. That goes to show you that Edison wasn’t always right, which is why he hired people all over the place to fix his errors and take their credit. I obviously wasn’t there for this, but the word on the street is that after a while, Dickson got tired of Edison’s BS and left Edisonville for his own pastures, creating the American Mutoscope Company with three other guys. The Mutoscope was another single-person viewer kind of deal – but people were getting sick of the novelty of the one-person peep show. They wanted something that more than one person could see at a time – I mean, how lame is it to take a date to a one-at-a-time movie? BUT OH HO HO, I found out – Dickson had been secretly collaborating with two guys, Otway and Gray Latham, who were part of the American Kinetoscope Company, a competitor of Edison Co. Dickson was working on a projecting Kinetoscope, and what was developed was called the Eidoloscope. So many scopes! HOW on EARTH did they keep track of them all?! Check out a few of Dickson’s movies – these are among the first movies, ever. Thanks IMDb, Victorian Cinema, The Edison Film, Essential Films, and Wikipedia! I assume you have read Empires of Light, if not, a must read for us light people.